NHL and NHLPA campaign celebrates diversity and inclusion in hockey. 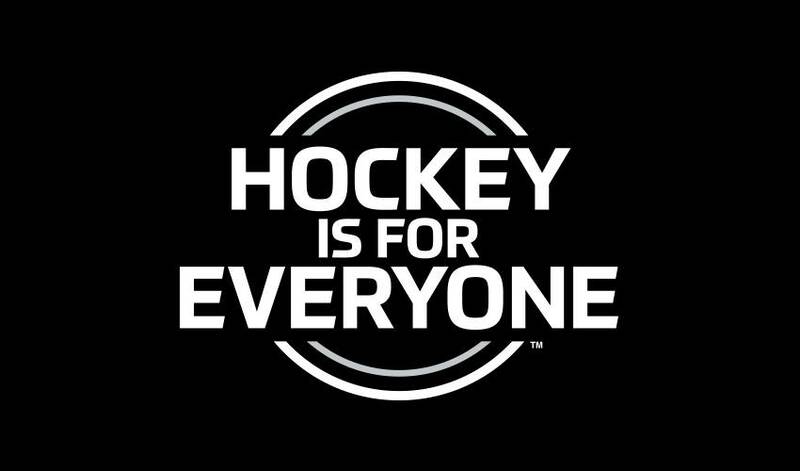 1 Hashtag for fans worldwide to join the conversation, #HockeyIsForEveryone. 5 Disabled grassroots hockey disciplines being played across North America, including blind, deaf/hard of hearing, sled/sledge, standing/amputee, and special hockey. 6 Colors in the Pride Tape rainbow representing inclusion and support of LGBTQ players on the ice, in the locker room, behind the bench, and in the stands. This year, more than 100 NHL players will wrap their sticks with Pride Tape to raise awareness for equality, respect, and inclusion. Fans looking to purchase Pride Tape can visit NHLShop.com or NHLShop.ca. 8 Hockey Is For Everyone month ambassadors who come from a variety of backgrounds and life experiences. This year, the hockey community is proud to work with the following ambassadors who will share their stories throughout the month: Shandor Alphonso, an NHL linesman since 2014 with a Trinidad-Jamaican background, making him the second-ever black official in the League; Sfc. Joseph Bowser, a 14-year military veteran, Staff Assistant to the Secretary of the Army, and member of USA Warriors, an ice hockey program for wounded veterans; Harrison Browne, who plays in the National Women’s Hockey League and is the first openly transgender athlete in professional hockey; Dave Jackson, the longest-tenured NHL referee who has worked more than 1,500 games since first joining the NHL Officials Association in 1989; Angela James, a renowned international hockey player who was inducted into the Black Hockey and Sports Hall of Fame (2006), the Ontario Colleges Athletic Association Hall of Fame (2006), and one of the first females to be inducted into the IIHF Hall of Fame (2008), Canada’s Sports Hall of Fame (2009), as well as the Hockey Hall of Fame (2010); Josh Pauls, captain of the U.S. National Sled team who will be competing at the 2018 Paralympics; Fred Sasakamoose, the first Canadian indigenous NHL player and an appointee to the Order of Canada (2017); and Harnarayan Singh, the first-ever Sikh commentator to do play-by-play of an NHL game in Punjabi and English. 9+ Women who will be part of an all-female production of NHL Network’s NHL Now on Wednesday, Feb. 28, featuring hosts, analysts, and reporters including NHL Network’s Jamie Hersch and Jackie Redmond, NBC’s Kathryn Tappen, NHL.com's Amalie Benjamin, as well as reporters Caley Chelios (Tampa Bay Lightning), Lauren Gardner (Colorado Avalanche), and Shannon Hogan (New York Islanders), who will all serve among the show’s pregame correspondents. Special guests will include Manon Rheaume, the first female goaltender in NHL history, and members of the U.S. Women’s National Team following their trip to the 2018 Olympic Winter Games. This production of NHL Now will feature an extensive recap of Team USA’s quest for gold, discussions focusing on the state of women’s sports, and the efforts of the Hockey Is For Everyone initiative. 18 Hockey Is For Everyone grassroots programs from across North America that will gather in Philadelphia Feb. 16-18 for the annual ‘Willie O’Ree Skills Weekend,’ where boys and girls from diverse backgrounds will take part in on-ice and off-ice skills and activities designed to help strengthen character, build confidence, and teach life skills. 28 Record number of teams that participated in the 2017 USA Hockey Sled Classic presented by the NHL, an annual tournament since 2010. This year, the sled teams were affiliated with 20 NHL Clubs. 31 Current NHL players who are Hockey Is For Everyone ambassadors. All have pledged to be leaders in the locker room and in the community. To see the full list, visit NHLPA.com. 60 Years since Willie O’Ree broke barriers when he became the first black player to compete in an NHL game on Jan. 18, 1958. O’Ree has been an NHL diversity ambassador since 1998, focusing on the League’s Hockey Is For Everyone initiatives. 80+ Hockey Is For Everyone events taking place throughout the month of February, including two national broadcast awareness nights – Tuesday, Feb. 6: MIN @ STL (8 p.m. ET, NBCSN); and Saturday, Feb. 17: FLA @ CGY (10 p.m. ET, SN360). The month also will include community and in-game activations with You Can Play and RISE (Ross Initiative in Sports for Equality) as well as ceremonies, clinics, and community activations with members of disabled hockey, women’s and girl’s teams, LGBTQ teams, First Nations programs, immigrants and newcomers, the military, and other new demographics. 120,000 Boys and girls who have participated in a Hockey Is For Everyone youth hockey program since its inception in 1998. These programs engage diverse communities across North America, using Hockey Is For Everyone values – dedication, perseverance, and teamwork – to teach kids positive life skills.